Exhibition Stands, Exhibition Stands UK, Exhibition Services | 200m2 | Stage Design Made Easy! Since launching our TECHwire stage trussing system earlier this year, we’ve been inundated with enquiries for stage design! The great thing about TECHwire is that the graphical panels simply click into place in between the framework. With a range of different effects and print options, 200m2 can create a stage design / backdrop to suit any event – indoor or outdoor. What’s more, our CAD designers can produce schemes and design options for you to review long before your show. This ensures that your approved design will hit the spot when the big day finally arrives. What you see is what you get! BUT the real beauty in terms of design is the new TECHwire product itself! 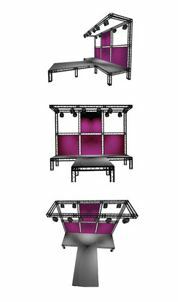 This new modular concept has been specifically designed for large scale applications such as stage shows, concerts or catwalks. Modular from the start, TECHwire is designed to scale upwards or downwards as needs require. TECHwire is made from the same outer material as 200m2’s other modular concepts called TRUSSwire and CROSSwire. As its name suggests, TECHwire is a technological innovation which combines strength and lightweight composite materials. The result is a weatherproof and scratch resistant gantry system which can be re-used time and time again. Made from a composite outer material in two colours (white or black) with an aluminium core, the TECHwire modular display system is extremely strong yet lightweight. Consequently, it is very environmentally friendly and cost effective to transport around the world. For applications like concert stages for example, TECHwire is set to make a big impact both visually and in terms of reduced transportation costs. To find out more about TECHwire, get in touch today. We look forward to hearing from you. Next Next post: Outdoor Exhibition Stands: Spring is here!